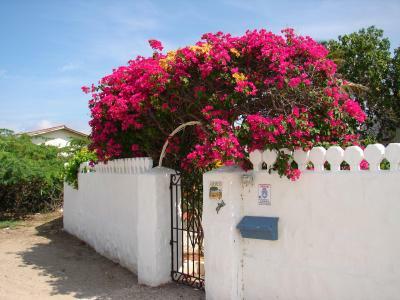 Lock in a great price for Villa Bougainvillea Aruba – rated 9.5 by recent guests! Perfect location with beautiful swimming right across the street. 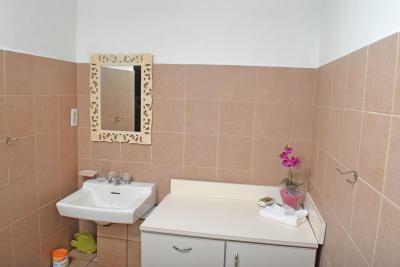 Clean, beautiful rooms and property. Great area to stay and wonderful people! We liked the guide to sights and restaurants. Very happy with everything. Rona, dogs, bed, pool, flowers and grounds, peace and quiet, price!! A very quiet place with only three, very nice rooms. 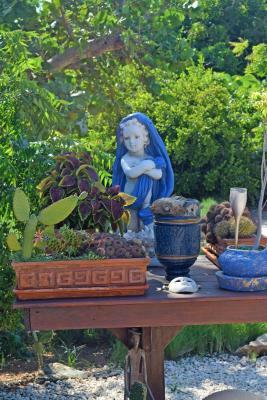 The garden has many plants and all kinds of pottery. 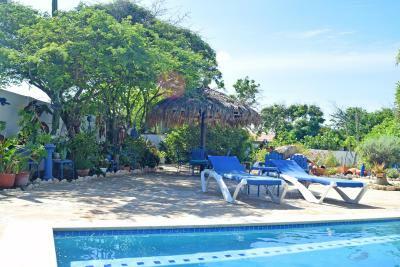 The swimming pool is good and the house is located in the Northern, less busy part of Aruba, near some small, but relaxed beaches. There are four dogs, so you have to like dogs to enjoy the place. 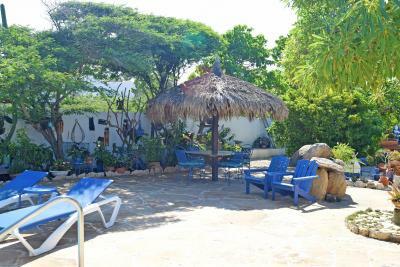 Quiet and comfortable location very close to Eagle Beach, one of Aruba's top snorkeling locations. 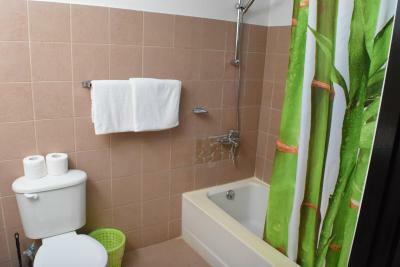 We had a large studio which was cleaned and provided with new towels 3x per week. 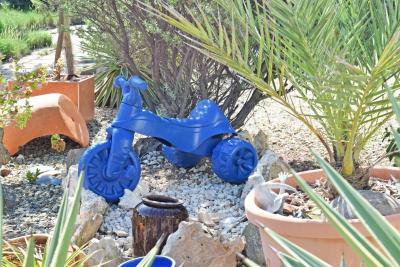 The garden with lots of vegetation and a swimming pool is very nice. The dogs are darling, they liked to seek our company whenever we were around. There was a large area in front of the house where we could park our car. We were not the only guests, but we mostly had the feeling that we had the entire place for ourselves. 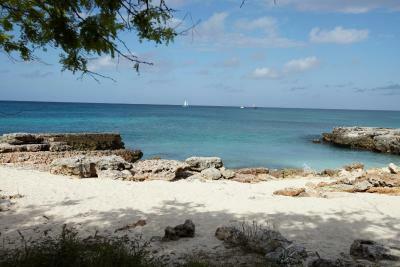 Eagle Beach is not only great for snorkeling but also for fishing. Great location, felt like a home away from. We were lucky almost had the pool and garden for ourselves . Appartments where spacious lots of space to put things. Rona is really friendly. We will surely come back. 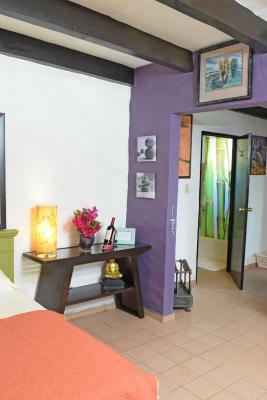 The ambiance is indescribable other than with the word "paradisiacal"! Loved the location and accommodations. We are dog people and unless you love dogs, don't stay here. Beautiful pool area. Hardly anyone was around so we had the area to our self most of the time. 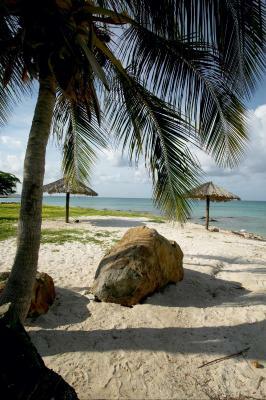 Very tropical and relaxing. Rona had fantastic recommendations for restaurants and daily activities. 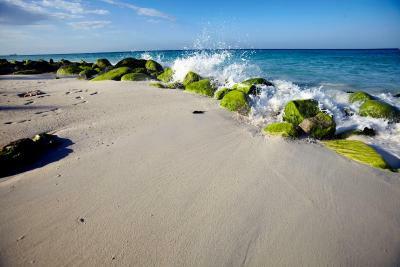 We had been to Aruba in the past so we had some familiarity with it. However, we loved a lot of her suggestions. There was one restaurant we went to again after my parents arrived. Located across the street from Malmok Beach, Villa Bougainvillea Aruba offers a fully equipped independent studio within a private villa. 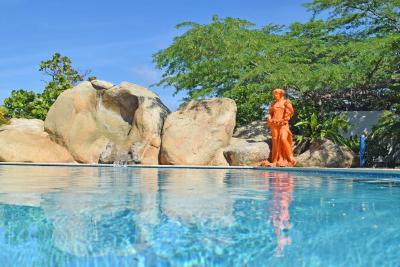 Guests can use the large swimming pool and tropical gardens. 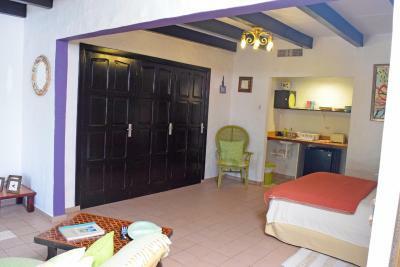 This self-catering studio features air conditioning, a TV and free WiFi. 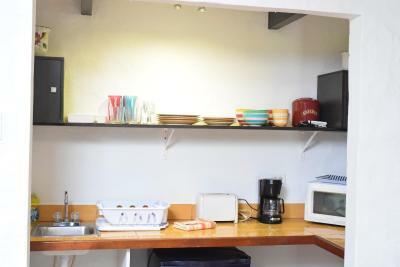 There is a fully equipped kitchenette with a microwave and a fridge. A housekeeping service is also included. 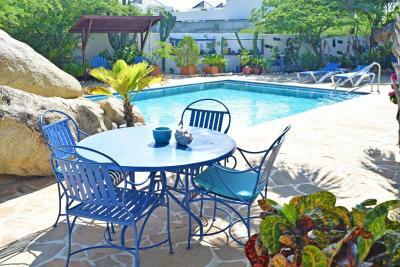 Villa Bougainvillea Aruba’s gardens feature colorful flowers, rock formations and barbecue facilities. 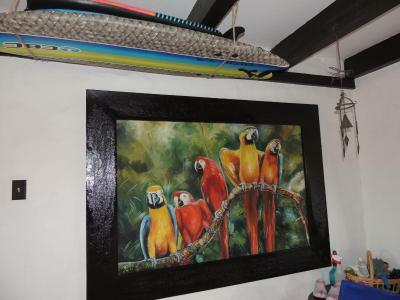 You can spot exotic birds or play with the owner’s friendly pets. 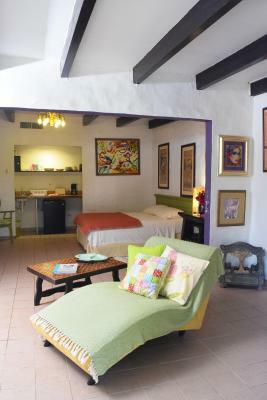 The property is located a 10-minute walk from the famous Tierra del Sol Golf Course and Country Club. Queen Beatrix International Airport is 8.1 mi away. 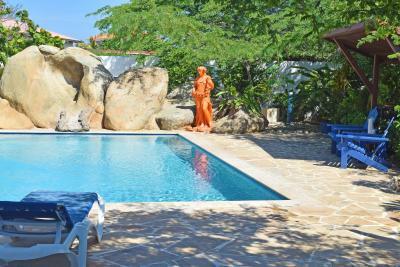 When would you like to stay at Villa Bougainvillea Aruba? 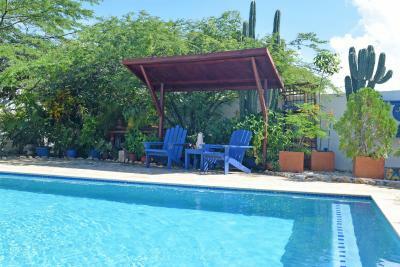 This villa features a patio, private pool and dining area. House Rules Villa Bougainvillea Aruba takes special requests – add in the next step! 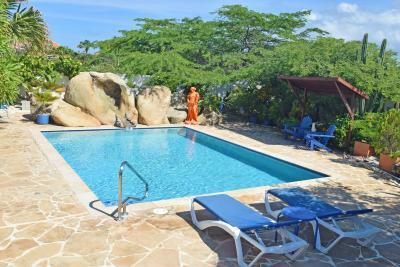 Villa Bougainvillea Aruba accepts these cards and reserves the right to temporarily hold an amount prior to arrival. 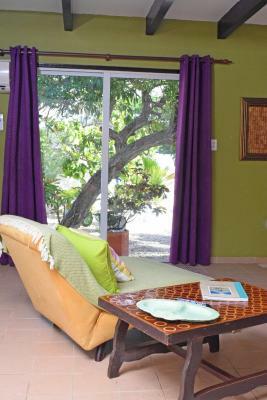 Please inform Villa Bougainvillea Aruba of your expected arrival time in advance. You can use the Special Requests box when booking, or contact the property directly using the contact details in your confirmation. No stove to cook on in my room, but it wasn’t a big necessity as Rona makes sure there are other appliances to assist with your needs. 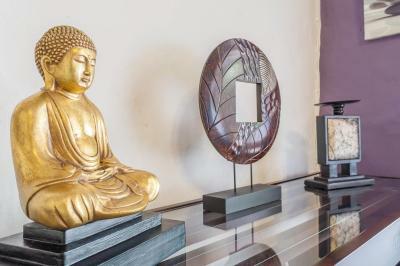 The property provided me with a serene secluded escape from the hustle and bustle located in the tourist districts of Palm Beach and Eagle Beach. 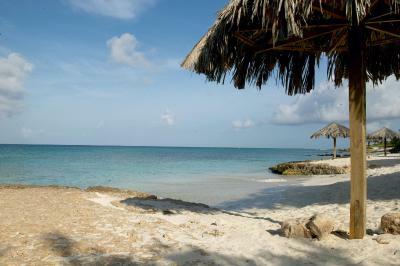 It’s located on a main road and essentially 5-7 minutes away (drive) from the tourist spots. 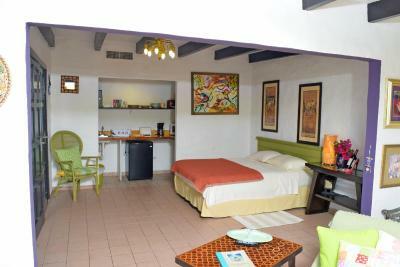 The property was clean and well equipped with everything I needed for my 5 night stay. In my room there was not a stove to cook, however, there was a microwave which was an essential necessity given the amount of food the establishments in Aruba give you to eat when you go out for meals. Rona and her staff are amazing and very attentive. The dogs are friendly and like to sit with you at the pool or at the doors to your rooms. They are not aggressive in any manner and are very protective of everyone on the property. They were a joy to be around and since I traveled to Aruba this time by myself, they made me feel safer. If your looking for a place to get away and find yourself, get in touch with nature, hear your own voice for a change...THIS IS THE PERFECT SPOT! The apartment had a kitchenette without cooking facility (we apparently misread the description). However Rona, the manager, let us use her barbecue. Well, the dogs crapped right outside our suite the morning of our departure day so I cleaned it up because no one was around. Not pleasant to look at when eating breakfast. It's a fantastic place. 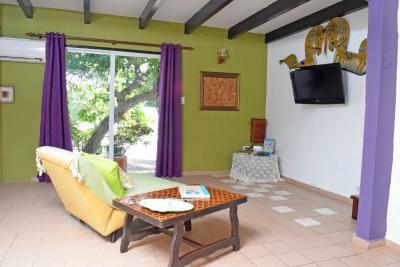 We loved everything about it: the room, the pool, the location close to gorgeous snorkeling places and mainly, the friendliness of Rona, the owner. She welcomed us with beers and cake. She gave us a cooler, beach chairs and snorkeling equipment. All for free. We wanted to go to 2 restaurants that had been recommended to us. When we asked her about them, she called the chef of both restaurants and got us reservations in their best tables. Amazing! We loved the experience. We felt like home all the time. So much better than staying in one of the huge, standard and expensive hotels in Palm or Eagle beach. 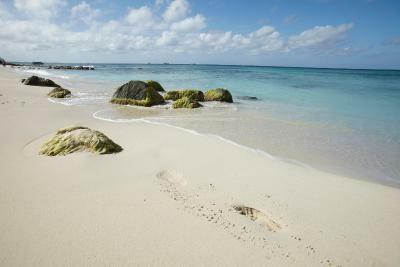 The location is great, you can walk (less than 5 minutes) to some gorgeous and not so touristic beaches. 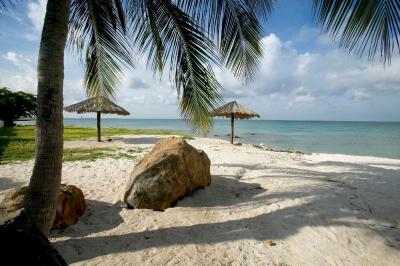 However, if you want to discover other parts of the island without having to depend on taxis, it's a good idea to rent a car, it's easy and cheap. We will come back. Thanks a lot Rona! 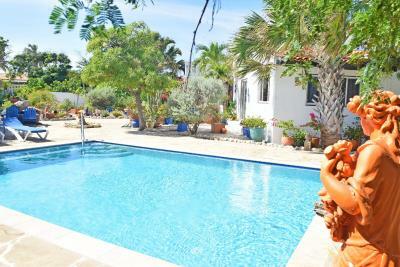 Lovely home, friendly , easy going pretty garden and pool. Bus just a few meters away. Amazing stay and vacation.We were so lucky to have the possibility to stay here.Absolutely lovely place with beautiful garden and pool in the Caribbean fleur. Rona, the ovner is wonderful and very helpful. She provided us with everything what we needed and more. Her dogs were great. We love this place and would come back here.